King of Atlantica, who is backed by the power of his trident. He has forbidden Ariel to have any contact with outsiders, which only led to her yearn to grow even stronger. He ruled the seas in "The Little Mermaid" (1989). The Sea King who rules Atlantica; the trident is the symbol of his power. Triton dearly loves his daughter Ariel, but to ensure her safety and the security of his kingdom, he's strictly forbidden her to have contact with anyone from the human world. The Sea King who rules Atlantica. At least, he used to—until Ursula changed him into a small, ugly sea creature. But he was willing to pay that price to save Ariel from Ursula's evil magic. "I thank you for saving my daughter. But there is no room in my ocean for you or your key!" King Triton is the aging, but still powerful, ruler of Atlantica. He is the father of Ariel, who he deeply cares for deeply. He has seven daughters; apart from Ariel, Andrina and Attina also appear in the series. He wields the Trident, which can be used to activate the world's Keyhole in Kingdom Hearts. Triton saves Ariel, Sora, Donald, and Goofy from some approaching Heartless. He is immediately distrustful of the three newcomers when they mention the "Keyhole" and later confronts them in Ariel's Grotto and advises Sora to leave since he is the Keyblade master, claiming that the Keyblade master is capable of nothing but to bring ruin to the worlds (by knowing this, Triton has possibly heard the story of the Keyblade War and the χ-blade). Ariel retrieves an item that can activate the Keyhole, but Triton destroys it before it can be revealed. Ariel falls victim to the plans of Ursula who steals the Trident, leaving Triton injured. After Ursula's defeat, Triton asks Sora to seal the Keyhole by using the Trident to uncover the Keyhole. After this, he becomes more trusting to Sora and his friends. King Triton is only mentioned by Ariel, Sebastian, and Ursula, but makes no appearance. Triton returns as ruler of the sea, but is concerned more than ever for Ariel after she saves a human, Prince Eric, from death and has fallen in love. He asks Sora to help her forget about the human world and practice her singing. Triton discovers a statue of Eric in Ariel's Grotto, and in his anger, he destroys it. Ariel once again falls victim to Ursula's plot and becomes a human for three days. By the end of the three days, Ursula captures Ariel and threatens to finish her off. Triton learns that she has signed a contract with Ursula, and not even he could break it. Instead, he replaces Ariel's signature with his own, in a bid to save Ariel's life. Ursula transforms Triton into a lowly sea creature and takes his Trident. The Trident is used against her by Eric and kills her. Triton finally accepts Ariel's love for Eric and allows her to stay with him by turning her into a human. He is seen in the end credits bidding farewell to Ariel and Eric with Sebastian and Flounder. Triton is a firm, strict, and easily angered monarch, but cares the world for his daughter, but is often too hard on her. He is dangerous when he is angry. He is also seen possesses some knowledge about the Keyblade and Keyhole. He seems to be a stubborn, cruel, and mean person, but all he cares about is the safety of his world and his daughter, and understands the importance of bearing the Trident. He is distrustful to beings that live outside his kingdom, both humans and inhabitants of other worlds, given by the fact that he immediately states that humans are evil creatures and that the Keyblade brings nothing but destruction and ruin. However, he is also accepting if someone proves otherwise. Triton as a polyp in Kingdom Hearts II. 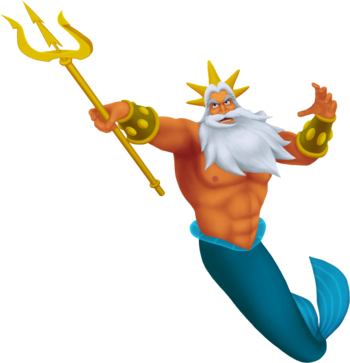 King Triton is an old, large merman with bushy, light grey eyebrows and long, white hair. He has a thick, white beard and mustache and a widow's peak hairline. He is well muscled and wears gold gauntlets with several studs on them on each wrist. As a merman, Triton's lower body is that of a dark blue fish with cyan, translucent fins. As signs of his royal status, Triton wears a yellow, five-pointed crown that somewhat resembles a sea star on his head, and carries the legendary trident, a golden, three-pronged weapon with powerful magical abilities. He also has blue eyes. In Kingdom Hearts II, when Ursula gains control of the Trident, she saps Triton of his power, withering him into a dark colored polyp. Originating from the 1989 film The Little Mermaid, King Triton is the ruler of Atlantica, and believes humans to be nothing but a threat, having lost his wife to rampaging pirates years prior. This fear causes him to forbid Ariel from going up to the surface, where humans are, which only increases her curiosity about humans. After discovering Ariel's grotto, he furiously destroys everything in it, which leads to Ariel trading her voice to Ursula so she can become human for three days. Afterward, Triton takes on the penalty of Ariel's bargain in order to save her, transforming into a lowly polyp. However, he transforms back to his mermaid form once Ariel and Prince Eric defeat Ursula. After seeing this act and realizing humans have the capacity to do good, Triton changes his ways and transforms Ariel into a human permanently, so she and Prince Eric can live happily ever after. This page was last edited on 17 January 2019, at 02:37.